John Sheldon is pictured at the height of his successful business career. 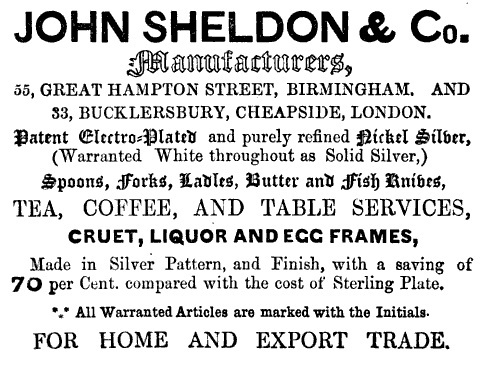 BIRMINGHAM MANUFACTURER John Sheldon was an astute and successful businessman, which begs the question of why he was so vague about his age and background. In successive ‘official documents’ he gave different dates and places of birth. In the 1840 census he said he was 40 and born in Birmingham. The following year, in an insurance document, he gave his date of birth as 13 August 1802, making him 43, and place of birth as Droitwich, Worcestershire. Despite nine years passing, he declared himself to be a year younger, claiming to have been born in Worcester in 1809 in the 1851 census making him 42. A year later, when he married for a second time, he said he was 45, implying he was born in 1807. In the last census in which he appears he declares that he was born in Worcestershire in 1806, meaning he was 55, while two years later his age was recorded on his death certificate as 57, which was later changed to 59 on his memorial stone in Key Hill Cemetery. Why the subterfuge? There might be many reasons, not the least of which might be pure vanity. He married Rebecca Aldridge at St Bartholomew’s Church in the city’s Edgbaston district on July 5 1827 a few weeks shy of her 18th birthday. Perhaps John did not want to admit to be considerably older than his new bride. With there being no formal birth certificates at the time, no-one was in a position to dispute his age. Then again, maybe it was due to him being a young man of ‘uncertain status and birth’, as his biographer Brian George so delicately puts it. Either way, it proved no obstruction to him making his way in the business world and in the wider city society. John and Rebecca’s first child, Elizabeth, was born in March 1828. The couple went on to have another eight children, though with new information now to hand it seems unlikely that any of them survived into mature adulthood. It seems likely that the last two of their number died in their early 20s, first-born Elizabeth, “after a long and painful illness” at the tender age of 23, and last-born Clara Jane at just 21. Raising children in the cramped, crowded and downright squalid housing conditions that existed in all fast-growing cities of the day, where killer diseases such as tuberculosis, scarletina, diphtheria, measles, influenza and infantile diarrhoea were rife, was not a task for the faint of heart. John’s four-storey town house in Great Hampton Street, though a substantial property, had to accommodate his family and 45 workers – in crowded unsanitary conditions. Even so, it would have been a big step up from his previous accommodation, in back-to-back housing in Lancaster Street, where eight or more similar properties were grouped around a common courtyard providing shared facilities for the washing of clothes and just one toilet for around 100 people. Another child, Emma, had died at the age of two in 1832, while two more, Georgiana in 1843 at the age of five and Alfred William, also in 1843, at the age of three, died while they were still at Lancaster Street. The city’s back-to-back ‘slums’ were notorious for overcrowding and poor sanitation and eventually, in 1875, the passing of the Public Health Act put a stop to them being built. Nevertheless, the thousands of dwellings still standing all over the city remained in use in one form or another, some for nigh on another 100 years. One example remains intact to this day, a National Trust museum telling the story of one particularly courtyard and some of its occupants from the 1840s right through to the 1970s. Nonetheless, John Sheldon’s business thrived in his new building, which offered 10,000 sq ft of space over three floors, plus a basement, comprising a house, warehouse, workshops, a counting house, stable, hayloft and even a garden with trees. The living accommodation was substantial, with seven bedrooms, sitting, dining and drawing rooms, kitchens and cellaring, plus a large showroom to display his wares. The 1851 census shows John as a widower living in Great Hampton Street with what’s left of his family, just three of the nine children he had by Rebecca. He is described as a silversmith employing 45 persons. With him are his three surviving children, Louisa, 14, Emily Rebecca, 13, and Clara Jane, 8. He has a housekeeper, Mary Mapp, 59, (born Herefordshire), described as his cousin. John gives his age as 42 implying a birth year of 1809. A year later, on 17th June 1852, John takes a second wife, marrying Elizabeth Amelia Yates at St Peter and St Paul Church, Aston. At 27, she is much younger than her husband, perhaps by as much as 25 year, and comes from the prominent Birmingham business family of John and Harriet Yates, her father being the owner of John Yates & Sons, manufacturers of electro-plated tea services, cruets, candlesticks, spoons and forks. 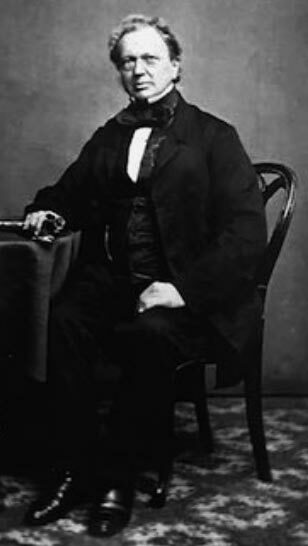 One of Elizabeth’s brothers, Edwin, became Mayor of Birmingham in 1865. The first of three more children was born in May of the following year, Amelia Eliza, quickly followed by another daughter, Edith Harriet in November 1855, and a son, John Henry, in March 1857. The 1850s were a period of great prosperity for John. He exhibited at the lavish and spectacular Great Exhibition of 1851 at Crystal Palace, London, which drew vast crowds from across Britain and abroad. He was listed in the official catalogue and his products were widely admired and favourably reviewed by many publications. Around this time, it appears that he also opened a London office. We only know of this through advertisements placed in various London-based publications at the time. It may simply have been an agency, but it was prominently located close to the Bank of England and the City’s important financial institutions. He was also prominent at the Birmingham Exhibition of Fine Arts in 1858, held at Aston Hall and opened by Queen Victoria. With that, John moved his family to a new home in Handsworth, then still a separate parish in the county of Staffordshire but later to become a fashionable commuter suburb as the acquisitive city reached out to incorporate parts of neighbouring Staffordshire, Worcestershire and Warwickshire within its boundaries. The 1861 Census shows him living at 2 Soho Hill, Handsworth, Staffordshire. He gives his age as 55, suggesting a birth year of 1806. With him is wife Elizabeth, 36, and daughters Clara Jane, 18, Amelia Eliza, 7, Edith Harriet, 5, and John Henry, 4. Bizarrely, on the census return his place of birth is given as “Worcester near Worcester”. John wasn’t granted much time to enjoy his retirement for three years later he died on 15th November 1863, three weeks after tragedy had again been inflicted upon the family by the death of daughter Clara Jane at the age of just 21. She may even have been the last survivor of John’s nine children by first wife Rachel, for we have no further knowledge of daughters Louisa and Emma Rebecca. John’s death certificate gives the cause of death as “apoplexy”, a term often used at the time to describe a stroke. Part three of this fascinating saga will examine John Sheldon’s family legacy, with a look at his American descendants and a hitherto unresearched Canadian family link.